And welcome to my newsletter for August, 2014! Please feel free to forward this to anyone whom you believe might be interested in keeping up with me! To receive these newsletters regularly, drop me an email or subscribe online from my website ( http://www.JefMurray.com ) or at: http://groups.google.com/group/Mystical_Realms . I’ve added 3 new painting images to my website at www.JefMurray.com . These include La Traveling East, Echoes on the Road, and The Counsel of Boromir. All three of these can be found in my Middle-earth -> The Third Age -> Lord of the Rings gallery. You can also find them all by going to http://www.JefMurray.com and clicking on the “Newest Works->Paintings” link at the top, left. In addition to the above, I’ve added some nine new sketch images to my website. 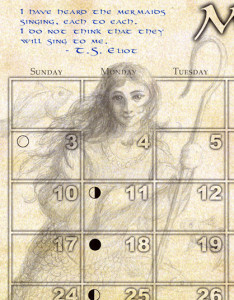 These can be found in the Middle-earth Sketches, Fairy Tale Sketches, and Soul & Spirit Sketches galleries, or you can see them all by clicking on the “Newest Works->Sketches link at the top left of my website. The discerning among you may be surprised when going to www.JefMurray.com. My website has been re-hosted and has a slightly different look and different menu layout. Please let me know what you think! This month, instead of providing a written reflection, I wanted to share a video that I created to introduce Fantastical Beasts & Beings: A Wizard’s Calendar 2015. This is my first full venture into storytelling in film, so, although I apologize for it being a shameless advertisement, I hope you will enjoy the look and feel of this “teaser trailer”. If folks enjoy this, I may venture into video “Ponderings” in the future. In any event, do let me know what you think!